The results are in for our Use It Again challenge! We were completely blown away by the amount of quality entries we received, and distilling them down to a smaller list of winners was a pretty excruciating task, but alas, someone had to bag the top prize. 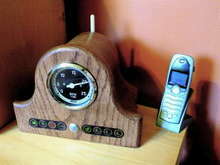 And that person was Instructables user radiorental, who transplanted the guts of a wireless router into an uber-slick vintage casing (pictured here), complete with a working analogue network traffic gauge pulled from an old boat. We'll be featuring it in an upcoming issue of PopSci, a nice bonus to go along with the sweet grand-prize Canon Rebel XT DSLR. The Van de Graaff generator is neat. I also sent it on to my grandson. Now how about a Jacob's Ladder as a follow up?